Fran Valera of Little Windows is back with another fabulous resin jewelry supplies giveaway and a special discount for all (see below)! This time I got a chance to review one of their latest products - a large round silicon cabochon mold which yields many half spheres of different sizes. It's just one of a number of great products from Little Windows. 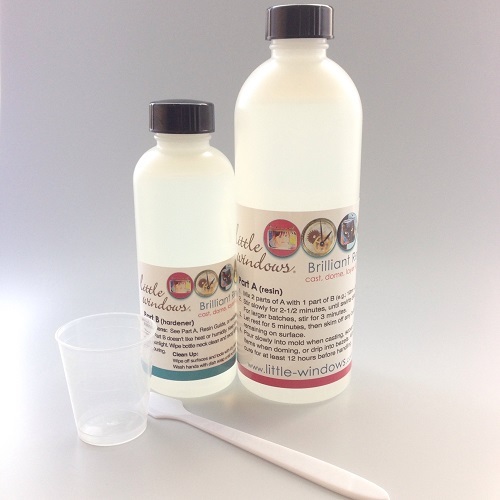 Little Windows' resin is excellent - glass like results which is perfect for jewelry makers. It is a very different formulation than others. The proportion to mix is not 1:1 but 2 parts of A to 1 part of B. The B part does deteriorate with time (turns yellow) so if you are not a frequent resin user, you can purchase a new B separately. Other resin manufacturers don't offer this. I also like their silicon products. 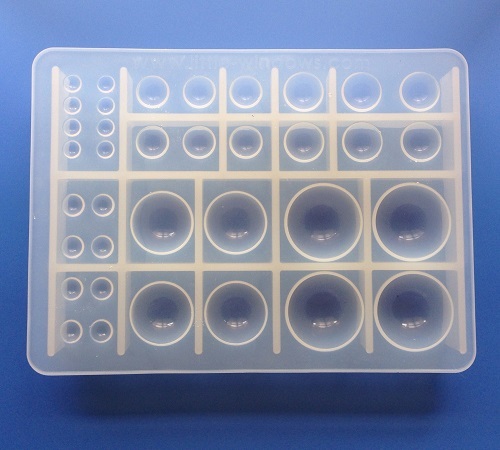 I bought their silicon doming tray which is fabulous because all spills, once cured, can just be popped away. The new cabochon mold I received for review has several advantages. First there are multiples of the same size. This helps when making sets of cabochons for earrings and bracelets. Or simply to make resin jewelry efficiently in batches and to allow for cabochons which didn't turn out as expected (I had some of those!) Silicon molds do not require mold release and those accidental spills can be easily removed the same way as the molded resin itself - just pop them out! Little Windows has an incredible number of creative video tutorials - that was how I came across them. I've also linked my favorite resin photo jewelry tutorials below. Watch Fran's how to video which shows many ideas for this cabochon mold. You are not limited to resin. 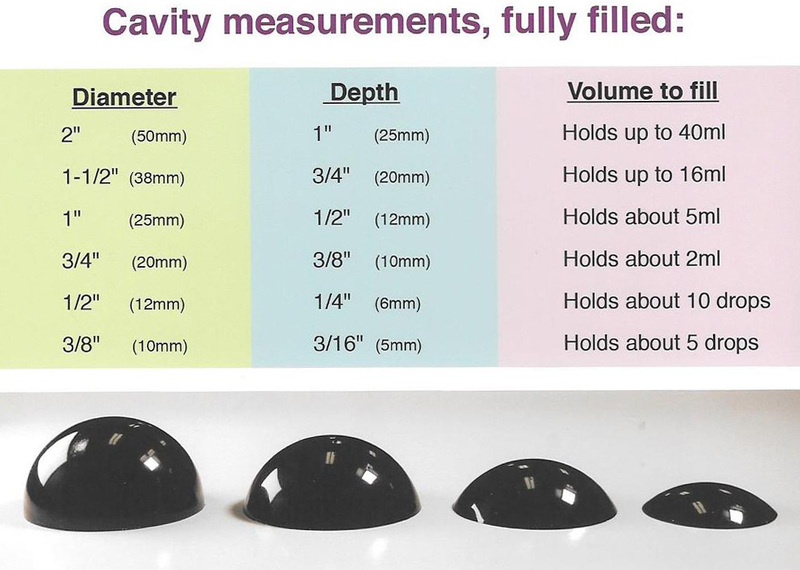 Consider using this mold for resin clay and polymer clay too. Other non-jewelry uses include soap, candle and candy making but please dedicate the mold for a particular use. The cabochon mold performed beautifully! I had a lot of fun making dried dandelion clock and flower jewelry. The mold is a good way to use for dried flowers which have depth - especially the dandelion clock - as opposed to flat pressed flowers. The tutorial for how to dry them using a very economical method is here. You can drill holes into the cabochons for jump rings as shown in Fran's video. Also check out my review of their spiral ratchet hand drill here. If you aren't confident with electric drills, consider this kind of manual drill. Instead of drilling holes into the cured cabochons, I used bezels as well as wire wrapping to finish them off. 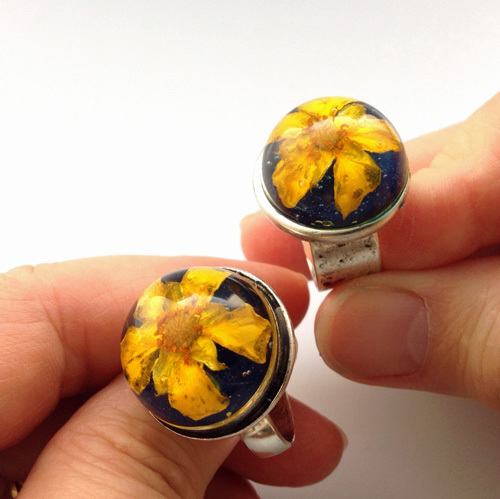 I had some misadventures learning experiences when I was embedding the dandelion and flowers into the resin which I shared in this tutorial on how to make real flower resin jewelry. 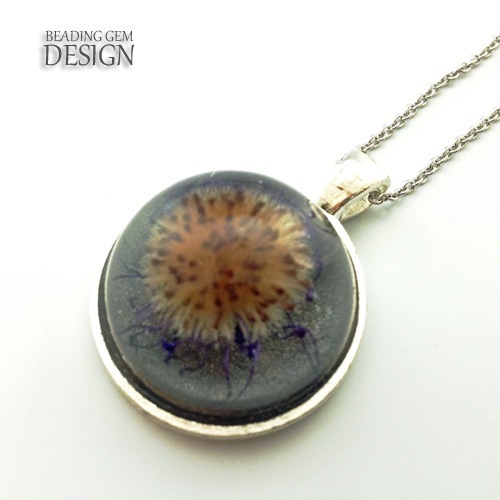 The third tutorial for the wire wrapped dandelion clock resin pendant is here. 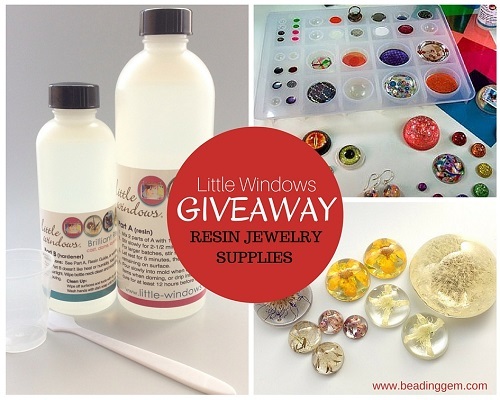 If you'd like to win $50 worth of resin jewelry making supplies from Little Windows, please make a comment below. Make sure you leave contact info below if you do not have an online shop or blog. It ends in a week's time at 6 pm EST Monday, November 2, 2015 . I will pick the winner randomly and announce the results as soon as possible after. So be sure to leave a contact email if you don't have an online link or make sure you come back and check! Otherwise I will redraw in a week. Good luck! All images were captured using my iPhone 5, the camera+ app and the Modahaus TS320 Tabletop Photo Studio in natural light. Photo editing was done in-app with final tweaks in Adobe Photoshop Elements. One challenge with photographing resin cabochons are the light reflections so I tried different poses to minimize them. Click for more information on my How to Photography Jewelry Webinar. Looks great! Would love to try it. This resin looks like it does a good job making jewelry. Can't wait to watch the videos. Oooh! I'd love to win this one...especially the mold. Wow that looks like fun. I have always wanted to try it but did not think I could do it and have it look nice. I would so love to add resin to my jewelry making skills. These are exquisite! I am a follower and have already shared this post on fb. We love Little Windows' resin and use it regularly! Thank you for the opportunity to win! That looks really neat, would love to try it!! Love your cabochon and wire wrapping. Br hank you for the discount. Would so love to win! Your pieces are beautiful! I am a blog and FB follower! Resin is so fun to work with. The ideas for what to make just never stop! The molding tray with multiple sizes of each cab is GREAT! I have always wanted to try using resin. This looks fabulous!! 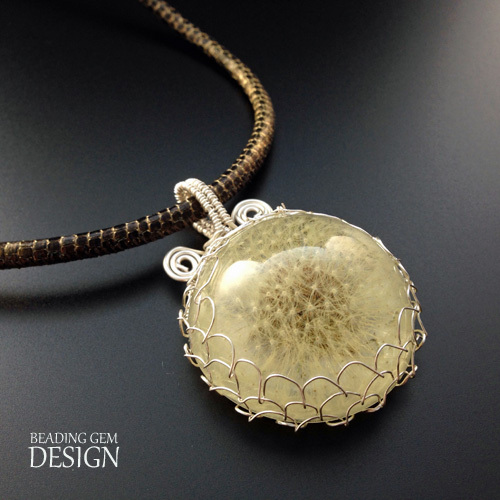 I can't wait to learn how to do the complete dandelion necklace. That is a project I would love to try. Thanks for the chance to win. I am a blog follower and would love to win this giveaway. Thanks for the chance. I would love to try them all, but the dandelion is very pretty. What a wonderful idea to offer so many sizes in one mold! The samples are beautiful. I would love to win this! Thanks for the chance! Yes, yes, yes. Looks like a wonderful opportunity. I'm a blog follower. LOVE LOVE LOVE This. Have been wanting to try it for so long now. I follow and shared on Facebook. I also shared on my blog about it. Oh, yes! I could do really cool things with this! Love your blog! And love LW =) Would love to win this, I am addicted to making cabochons. This would be awesome to learn to make. OMG, if I ever win anything, let it be this one! I have resin at home but wasn't sure how to use it well. I want to learn and this is a good place to go. I love resin! Great giveaway. I am a blog subscriber, a FB follower and pinned the contest. Would love to win this one, because I have a real interest in getting started using resin. Oh - Oh - oh! Pick me please!! (even though I know it's random I had to throw that in there). I think Little Windows has come up with the perfect solution - especially for people like me who live in a (colder) climate that doesn't work well for 2 and 3 day cures. Especially in a large studio. The temps never stay high enough to cure the resin properly. That's the reason why I have yellowing parts to my resin because I can never find the window that allows for warm enough days to do this. That or I'm so busy outside when it's warm that I'm not in my studio. I've always wanted to get really involved with resin and I've got my dried flowers and plants ready to go but can't find the right time. I think knowing that I could always get a separate Part B would really help my mind-set. I would look at my resin as being more friendly instead of a monster waiting to ruin my attempts at creativity. The doming tray also sounds marvelous. I know for a fact that my studio floor slopes to the west. Every single round bead I drop on the floor runs to the west wall so resin would do the same thing. Having the doming tray (levelled) would help solve that runaway problem. I also think these cabochon molds are fabulous!! Woohoo!! Getting the perfect mold is always so difficult and having everything you need for resin in the same place is an absolute bonus in my books! Very exciting. I am a subscriber and have shared on my blog. Love the depth of these cabs! That's hard to find. As the grandmother of 12 beautiful grandchildren I would simply love to win this new medium of jewelry!! I've used other resins and this looks like it might be even better than what I am now using. I would love to try this out. And the molds. Oh my. They would be useful for lots of things. I would love to try resin in my jewelry creations and this looks like the product I need to use to get started. The mold would be perfect for what I had in mind. Hands down this is the best jewelry grade resin. Love, love little windows. It would be sweet to win! Looks very straight forward, perfect for a novice like me! I am a beginning jewelry maker and I am always seeing things on here that I would like to try! This looks cool! Would love to win! Wow great give away, would love to win. I use Little Windows resin and have some of the molds. They are fantastic, now I would love to have the multiple cabochon mold too. Also love the many additives LW has for me to purchase as well a many different sizes of part 1 & 2. Thanks for offering this contest and the coupon code!!! Have always wanted to try this! I can see all kinds of use for this product with my kumihimo creations. Enter me, please. Wow, I've been a loyal customer of Little Windows for a while now. Awesome supplies. I am so in love with the flower rings. If I don't win, I'll buy to anyway. But, it sure would be nice to win! I would love to try resin.....it would be a great addition to my current jewelry making. This is very exciting! I have wanted to play with resin for a very long time. The variety of examples shown are just beautiful! Thank you Pearl and Fran Velara for this drawing. Have always wanted to do resin jewelery, this will let me personify my jewelery, I am currently unemployed and trying to do this a means of income while I get back on my feet. 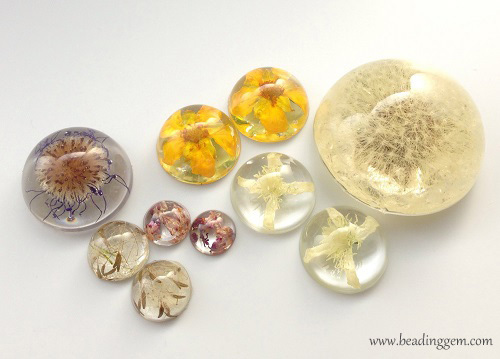 I love how the flowers look encapsulated in the resin. I'd love to try this. I like how the resin mold is designed, too. Thanks for another great giveaway. Looks really creative! Would love to try this. Count me in! Would love to win this!! It looks like fun. I've been interested in Little Windows Resin for quite a while. This would be a great opportunity to try it out! I have always wanted to "freeze" things in glass. Now there's resin and these tools! So happy! Have always wanted to try resin. What a great start. Your pieces are so enchanting - I love that you capture a moment in time! I would love to win this giveaway!!! I've been wanting to try resins forever! The dandelion looks amazing. I would love to try resin! I love working with resin & how it creates the illusion of items floating in glass. Well this looks like all kinds of fun! Even my daughter wants in on this one lol Please throw my name in the hat Pearl! Cabochon molds look super handy and the resin looks beautiful!I haven't used this brand yet but I love that it doesn't yellow. How absolutely beautiful! I never imagined that a dandelion puff could be captured this way. And that resin tray looks so handy! Thanks for the chance to win! Resin is one of those jewelry things that I'm a little fearful to start - what if my item inside the resin doesn't hold its color? What if the bezel is wasted because the resin item didn't come out right? I like the idea of silicone molds - just pop the out when done. The tutorials and molds looked awesome to try! This is a great giveaway! I want to try this! I absolutely LOVE resin jewelry. I especially adore when there are bits of nature in it. I would love to try resin. At our local Harvest Festival I sow a clover jewelry I like it a lot. I am a blog subscriber always looking for new techniques. 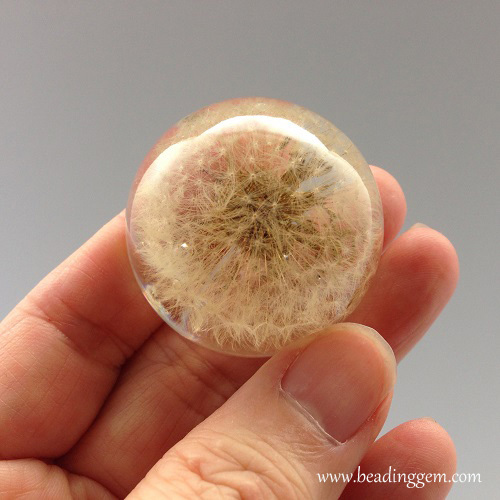 I haven't used resin at all but love the dandelion design. I've started working with resin for nearly a year now and would love to try their products - especially trying the dandelion designs. I love it! Thanks for the chance to win this AWESOME giveaway!!!! My daughter just recently got into this and this would make a great Christmas gift for her! Hi Pearl, I just found your site and I love all of you work and advice! I'm excited to keep following you! I also hope to win the Little Windows resin set! But if it's not me, then I can use the nice coupon. Thanks and hugs! I got excited by reading the article. I plan on doing resin in my jewelry making and this would be something that would //could turn around a less than stellar year. I would love to give this a try! Please enter me in the drawing. We will have to check out this resin for use in making paperweights!